Formerly of Grafton, late of Casino. Much loved Father and Father-in-law of Joshua and Clare, Rose, Jerome and Jess, and Theresa. Pop of Ian, William, Nicholas, and Sienna. Brother of Carmelita. 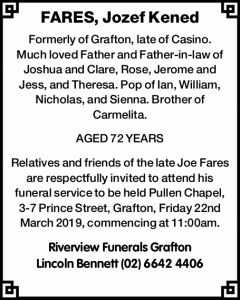 Relatives and friends of the late Joe Fares are respectfully invited to attend his funeral service to be held at Pullen Chapel, 3-7 Prince Street, Grafton, Friday 22nd March 2019, commencing at 11:00am.